The family of three-time world champion cyclist Kelly Catlin, who died aged 23 last week, say she had changed after crashing her bike last year. They believe she took her own life as a consequence of two accidents. Catlin broke her arm last October, which was followed by a crash in December in which she sustained concussion, her family have told The Washington Post. "She was not the Kelly that we knew," her father Mark Catlin said. "She spoke like a robot. We could get her to talk, but we wondered, 'what has happened to our Kelly? '," he added. 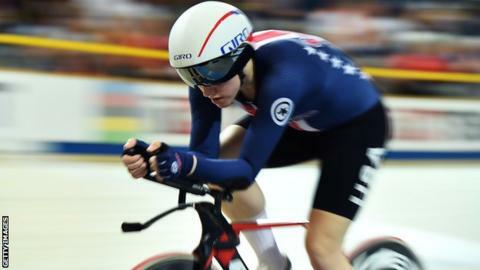 Catlin won three successive team pursuit world titles and an Olympic silver for the US team and also individual pursuit bronze at both the 2017 and 2018 World Track Championships. She won all three of her world titles alongside Chloe Dygert Owen and Jennifer Valente, while Kimberly Geist was part of the 2017 and 2018 triumphs after Sarah Hammer rode in 2016. Catlin, who was born in Saint Paul and was one of a set of triplets, graduated from the University of Minnesota last year with degrees in mathematics and Chinese and was studying computational and mathematical engineering at Stanford University in California. Her father said that she attempted suicide in January, before ending her life last week. "For her, she could no longer concentrate on her studies or train as hard. She couldn't fulfill what she felt were her obligations to herself, she couldn't live up to her own standards." Catlin's sister, Christine, said her sibling had also complained of headaches and light sensitivity, and had written in an email that "her thoughts were racing all the time". Her brother, Colin, added: "Just a week or two ago, we were making plans and I was optimistic about her future." In a recent blog for the velonews.com website, Catlin had written that she sometimes felt as if she needed "to time-travel to get everything done. And things still slip through the cracks. "It's like juggling with knives, but I really am dropping a lot of them. It's just that most of them hit the floor and not me."